Josh and his ..girlfriend!!!. everybody nos this hottie haz a gf... but hes lucky cuz shes pretty and im jealous but i still प्यार him! *starts crying...* ps. her name is shannon wada. Wallpaper and background images in the जॉश हचरसन club tagged: josh pic movie shannon wada. Ugh hes single he admitted on loads of interviews!Duh!!!! lets kill her like josh (peeta) killed the hunger games!!! lol jk! I AM HER U GUYS! So stop with not nice comments!!!!!!!!!!!!!!!!!!!!!!!!!!!!!!!!!!­!!!­!!!­!!!­!!!­!!!­!!!­! Lol peetalover125 you wish you were Shannon. Don't be delusional. 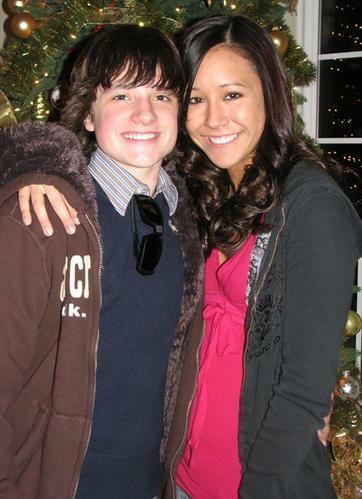 And awwww Josh was so adorable at 14 I can't believe how much he has grown since then both looks and actor wise. He is truly my idol. I really do think Jennifer Lawrence and him would make a perfect couple.